Nicolas Jean-de-Dieu Soult (1769-1851), French General and Statesman. Sitter in 3 portraits. Arthur Wellesley, 1st Duke of Wellington (1769-1852), Field Marshal and Prime Minister. Sitter associated with 439 portraits. Archibald Alexander Park (active 1835-1863), Engraver, publisher and printseller. Artist associated with 1 portrait. 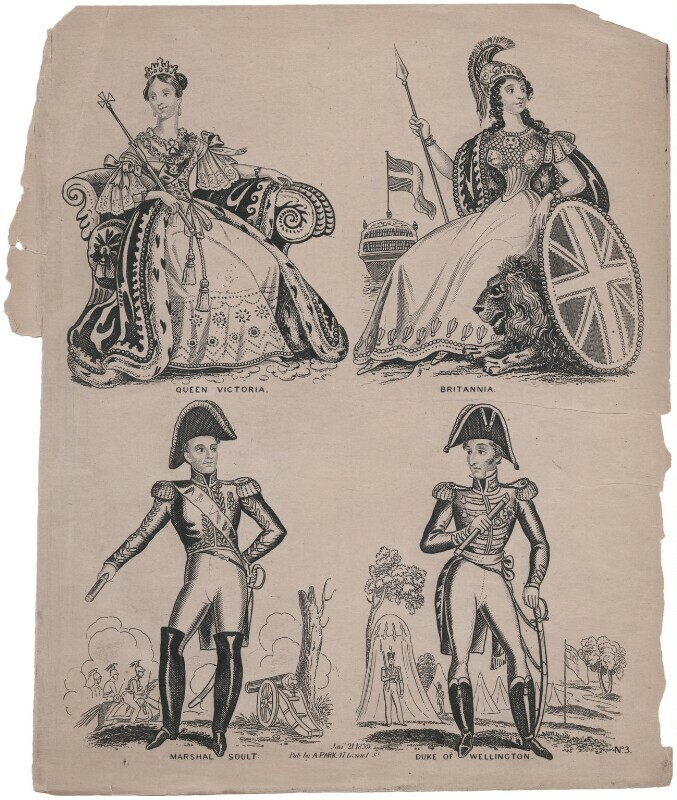 The Bedchamber crisis strains relations between the government and the monarchy, after Queen Victoria refuses to dismiss her Whig-appointed ladies of the bedchamber at the request of the new, Conservative Prime Minister Sir Robert Peel. Peel resigns and Melbourne returns as Prime Minister. The Grand National is first held at the Aintree race course, won by the horse Lottery, and the first Henley Royal Regatta, the rowing event, is held on the Thames. The French and British scientists Louis Daguerre and William Henry Fox Talbot separately publicise their experiments with the new form of photography. The prolific journalist Harriet Martineau publishes her three decker novel Deerbrook, the story of middle class country life. The first Opium War with China is sparked after the British government refuses to try six British soldiers accused of killing a Chinese man protecting a temple from looters. Relations were strained as Britain had promoted the drug opium in China to boost trade. Winning the war, Britain secured vital trading rights. African captives aboard the Spanish ship La Amistad revolt, resulting in a highly publicised court case.